Give me some green beans, a few slices of cucumber, a couple leaves of lettuce and a bit of broccoli and I’m happy as a clam. That’s a salad. What really gets my goat is when people proudly tout their macaroni monstrosity and dare to tack the word “salad” onto its name. A salad has green things in it. A salad has vegetables. A salad does not consist of cold pasta and mayonnaise. I’m sure your plate of bocconcini and basil is great, but quit pretending it’s a legitimate salad. Give me a break. If 50 per cent of the ingredients in your so-called salad are cheese then you cannot seriously claim it deserves that title. Don’t get me wrong; I love eating mounds of cheese and I do it all the time. But at least I have the good sense to recognize that a dish consisting mainly of dairy products with a few slices of tomato thrown in for good measure is not exactly salad material (though it sure is damn tasty). Pasta “salad” is arguably a greater offence than a jumble of cheese and tomatoes is. Even when it has a few stray slices of red pepper or some baby corn thrown into the mix, it’s still an insult to genuine salads everywhere. For some reason that remains beyond me, people have just been getting away with this overly liberal use of the term. 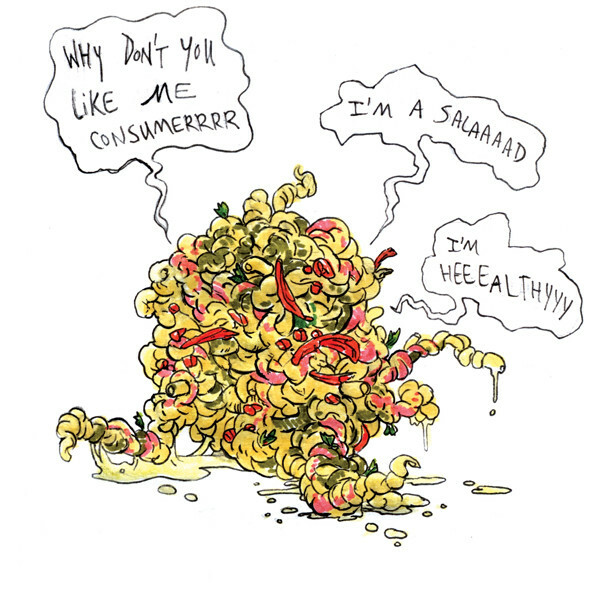 I say it’s high time that a new word was created for salad shams like pasta “salad,” just to avoid confusion and rage-filled rants by people like me. I am currently accepting submissions for this dynamic new term that will accurately describe such abominations—right now I’m thinking of the word “choontz.” Chicken and egg “salad” will obviously qualify as well; how someone mistook those mayo-slathered messes for a salad we may never know. Wake up sheeple, you don’t win friends with fake salad.